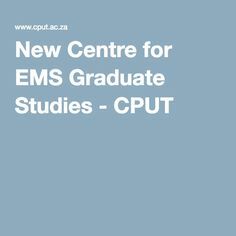 The Centre for Postgraduate Studies (CPGS) was established in 2009 with the responsibility to coordinate postgraduate studies and postdoctoral research at the Cape Peninsula University of Technology (CPUT). In the case of postgraduate studies, the Centre liaises with prospective and current postgraduate students. In the former case the Centre links students to faculties through the faculty research coordinators (FRCs). In the latter case the Centre, in conjunction with the FRCs, assists students in complying with the requirements of the Higher Degrees Committee (HDC). In both cases above, the Centre manages all postgraduate bursaries at CPUT. These include the CPUT bursary, the Mauerberger bursary, the NRF bursaries in all their forms, as well as other grants.